Sara Ross, No. 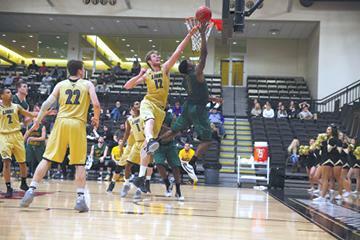 11, dribbles down the court in a 90-54 win over Southern Arkansas University on Nov. 10 at Robert F. Hyland Arena. The Lindenwood women’s basketball team is off to a hot start as the Lions are 4-0 to begin the 2017 season. The Lions look to capture their fifth win of the season as they host Saint Louis College of Pharmacy on Monday, Nov. 27, at the Robert F. Hyland Arena. The Lions are fresh off a 77-64 victory against the previously undefeated University of Illinois Springfield, which took place on Nov. 18. The early-season slugfest was headlined by double doubles from not one, but two forwards for Lindenwood: sophomore Kallie Bildner with 19 points and 15 rebounds and sophomore Gabby Walker with 23 points and 11 rebounds. Bildner averages a double double per game with 21.3 points per game and 14.8 rebounds per game. The sophomore also leads the team in blocks, averaging 1.8 blocks per game. Despite a slow start to the season, Walker is the second leading scorer on the team averaging 17 points per game and leads the team in field goal percentage with .647. In four games, Lindenwood has a margin of victory of 34.75 points with the closest game coming against the University of Illinois of Springfield with the Lions winning by 13 points. The Lions are 3-0 this season at home and are averaging 84.3 points per game while only allowing 42.3 points per game. Lindenwood will have three games at home this week before playing its first conference game on Dec. 7 against Pittsburg State University.